It appears that post-doom metal French band Caldera has come full circle. Originally an instrumental group, they experimented with vocalists a few years ago, only to return to the instrumental format for their new disc, Mist Through Your Consciousness. 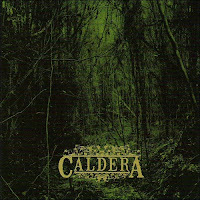 The album name and song titles (named after tree species) may cause you to fear that you’re in for some mushy hippie nonsense, but Caldera provides enough mean riffage to dispel all thoughts of brown rice and Birkenstocks. The album cover art is a claustrophobic vision of some sinister woodland of Weir, which is a lot closer to the record’s spirit. The fact is, Caldera follows their muse wherever it takes them, and damn the consequences. This music is epic, melodic, flowing, layered, and tight as hell. Acoustic sits beside electric while light flows into dark, by turns as quiet as a woodland sprite whispering in your ear or huge and slamming as an army of angry Ents, all interconnected in a series of colorful instrumental dreams. It was extremely interesting for me to read the article. Thank you for it. I like such topics and everything connected to this matter. I would like to read more on that blog soon.